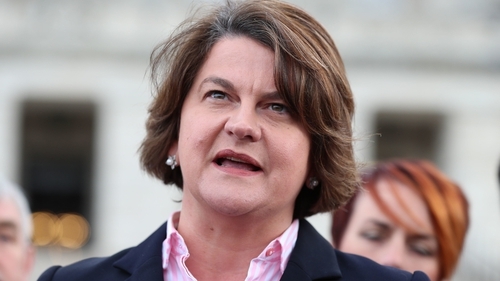 DUP leader Arlene Foster has said she would prefer no Brexit deal to a bad deal, describing current plans as amounting to "the annexation of Northern Ireland" by the EU. Ms Foster will meet with Taoiseach Leo Varadkar in Dublin on Monday to discuss a number of current issues. British and European Union negotiators this month have accelerated the push for a Brexit deal but talks remain snagged on the issue of the border. "I fully appreciate the risks of a 'no deal' (Brexit) but the dangers of a bad deal are worse," Ms Foster wrote in an article in the Belfast Telegraph. She added: "This backstop arrangement would not be temporary. "It would be the permanent annexation of Northern Ireland away from the rest of the United Kingdom and forever leave us subject to rules made in a place where we have no say." In the absence of a comprehensive EU-UK trade partnership after Brexit, the EU is seeking a backstop arrangement whereby Northern Ireland would effectively remain subject to the bloc's regulations to avoid a hard border. But the DUP, whose support British Prime Minister Theresa May needs to pass legislation in Parliament, vehemently opposes any proposals under which the province would be treated differently to the rest of the UK. Britain wants any backstop arrangement to be time-limited. Hardline supporters of Brexit in Mrs May's ruling Conservative Party fear it could be used to keep the whole UK inside a customs union indefinitely with the EU. Ms Foster said her party, which has 10 MPs in the UK parliament, was not bluffing in its tough stance on the talks. "This is no game. Anyone engaging in this in a light-hearted way foolishly fails to grasp the gravity of the decisions we will make in the coming weeks," Ms Foster said. She added: "The coming days, weeks and months will be critical. The decisions taken will shape the type of Northern Ireland that our grandchildren will live in." Ms Foster said she wanted to secure a deal that would work for both Northern Ireland and the Republic of Ireland and said she would travel to Dublin for talks on Monday. In an article in another Northern Ireland newspaper, the Belfast News Letter, former British foreign minister Boris Johnson also took aim at the backstop, describing Mrs May's agreement to accept a backstop as a "dreadful mistake". "The only way to put things back on the right track is to ditch the backstop" Mr Johnson wrote. The UK could remain tied to Brussels' rules beyond the end of 2020 to give negotiators more time to finalise a trade deal, according to reports. The potential extension of the transition period, which would see the UK stay in the EU single market and customs union, is being considered as intensive negotiations continue ahead of a crunch summit in Brussels on Wednesday. Under the current plans, if there is a Brexit deal the transition period will last until the end of 2020, during which the UK will accept Brussels' rules without having a seat at the table when they are decided. But the Guardian and Daily Telegraph have reported that the option of a potential extension was being considered by negotiators in Brussels to allow extra time to draw up a deal on the future UK-EU relationship - and avoid the need to use backstop arrangement to avoid a hard border. The British Department for Exiting the European Union said it would not comment on speculation.